For other uses, see The Witcher (disambiguation). "Wiedźmin" redirects here. For other uses, see Wiedźmin (disambiguation). The Witcher (Polish: Wiedźmin, Polish pronunciation: [ˈvʲɛd͡ʑmʲin]), by Polish writer Andrzej Sapkowski, is a fantasy series of short stories and novels about the witcher Geralt of Rivia. In Sapkowski's books, "witchers" are monster hunters who (with training and body modification) develop supernatural abilities at a young age to battle deadly beasts. The books have been adapted into a film, a television series, video games, and a graphic novel series. The series of novels is known as the Witcher Saga. The short stories and novels have been translated into numerous languages, including English. Cover of the first book. The books have been described as having a cult following in Poland,[not in citation given] the Czech Republic, Hungary, Slovakia, Ukraine, Romania, Russia, Serbia, Bulgaria and other Central and Eastern European countries. The video games have been very successful, and as of March 2018, they have sold over 33 million copies worldwide. The Witcher short stories were first published in Fantastyka, a Polish science fiction and fantasy magazine, beginning in the mid-1980s. The first short story, "Wiedźmin" ("The Witcher") (1986), was written for a contest held by the magazine and won third place. The first four stories dealing with the witcher Geralt were originally featured in a 1990 short story collection titled Wiedźmin (The Witcher) — now out of print — with "Droga, z której się nie wraca" ("The Road with No Return"), which is set in the world before the Witcher stories and features Geralt's mother to be. The second published short story collection was Miecz przeznaczenia (Sword of Destiny). Although Ostatnie życzenie (The Last Wish) was published after Sword of Destiny, it replaced The Witcher as the first book since it included all the stories in The Witcher, except "The Road with No Return" (the only story without Geralt). Although new short stories were added to The Last Wish, they took place before those in Sword of Destiny. Although "The Road with No Return" and "Coś się kończy, coś się zaczyna" ("Something Ends, Something Begins", an alternate ending of the Witcher saga about Geralt and Yennefer's wedding written as a wedding gift for Sapkowski's friends) were later published in 2000 in Something Ends, Something Begins and in 2012 in Maladie and Other Stories (Maladie i inne opowiadania) collections, the other stories in those books are unconnected to the Witcher series. In some Polish editions, "The Road with No Return" and "Something Ends, Something Begins" are added to The Last Wish or Sword of Destiny. 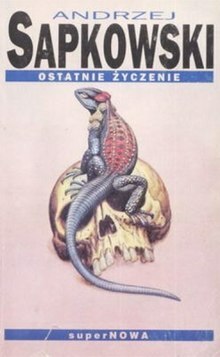 Ostatnie życzenie (The Last Wish) (1993, English edition: 2007) – Note that while The Last Wish was published after Sword of Destiny, the stories contained in The Last Wish take place first chronologically, and many of the individual stories were published before Sword of Destiny. The saga focuses on Geralt of Rivia and Ciri, a child of destiny. Ciri, princess of a recently conquered country and a pawn of international politics, becomes a witcher-in-training. Geralt is drawn into a whirlwind of events in his attempts to protect her. Sezon burz (Season of Storms) (2013, English edition: 2018) – Set between short stories in The Last Wish, but containing a few hints on events which follow the original pentalogy. Coś się kończy, coś się zaczyna (Something Ends, Something Begins) (2000) – Stories by Sapkowski, including two Witcher stories: "The Road with No Return" and "Something Ends, Something Begins". Maladie i inne opowiadania (Maladie and Other Stories) (2012) – Stories by Sapkowski, also including "The Road with No Return" and "Something Ends, Something Begins". Chosen by Fate: Zajdel Award Winner Anthology (2000) - English anthology, by SuperNOVA in cooperation with the Silesian Club of Fantasy Literature, included a translation by Agnieszka Fulińska of "The Witcher" short story entitled "The Hexer". The story also appears, with a different translation, in The Last Wish as well as in A Polish Book of Monsters. A Polish Book of Monsters (2010) – English anthology edited and translated by Michael Kandel, with a translation of "The Witcher" short story entitled "Spellmaker". In 2013, the Polish publishing house Solaris published a collection of eight short stories, Opowieści ze świata Wiedźmina, written by eight Russian and Ukrainian fantasy writers (including Andrei Belyanin and Vladimir Vasilyev) set in the world of The Witcher and/or featuring characters from the saga. In 2017, a similar collection of eleven short stories by eleven authors, chosen through a competition organized in 2016 by the Polish magazine Nowa Fantastyka, was published by SuperNowa. The stories are set on the Continent, which was settled several thousand years earlier by elves from overseas. When they arrived, the elves encountered gnomes and dwarves. After a period of war between the elves and dwarves, the dwarves retreated into the mountains and the elves settled in the plains and forests. Human colonists arrived about five hundred years before the events in the stories, igniting a series of wars. The humans were victorious, and became dominant; the non-human races, now considered second-class citizens, often live in small ghettos within human settlements. Those not confined to the ghettos live in wilderness regions not yet claimed by humans. Other races on the Continent are halflings and dryads; werewolves and vampires appeared after a magical event, known as the Conjunction of the Spheres. During the centuries preceding the stories, most of the Continent's southern regions have been taken over by the Nilfgaard Empire; the north belongs to the fragmented Northern Kingdoms. The Witcher saga takes place in the aftermath of the first major war between the Nilfgaard Empire and the Northern Kingdoms, with a second war beginning in the middle of the series. Geralt of Rivia (Polish: Geralt z Rivii), known also as Gwynnbleid (Elder Speech: "White Wolf") and the Butcher of Blaviken, is the protagonist of the series and its adaptations. A witcher, who travels the Continent and makes a living hunting monsters that plague the land. Péter Apor argues that he embodies the "neo-liberal anti-politics" spirit of the Polish popular culture of the 1990s. Yennefer of Vengerberg (Polish: Yennefer z Vengerbergu) first appeared in the collection of short stories, The Last Wish, featuring in both "The Last Wish" short story and "The Voice of Reason" frame story. She went on to appear in numerous other Witcher stories as the "soul mate" of Geralt and is one of the main characters of the Witcher saga. Cirilla Fiona Elen Riannon (known as Ciri, from the name Zireael in the Elder Speech (meaning "Swallow"; Polish: Jaskółka), also known as the Lion Cub of Cintra, Child of the Elder Blood, and the Lady of Time and Space, is the princess of Cintra, daughter of Pavetta and Duny (also known as the Urcheon of Erlenwald) and granddaughter of Queen Calanthe. She is also Geralt's and Yennefer's adopted daughter, around whom much of the plot is centered. Ciri is a descendant of Lara Dorren and has the Elder blood which gives her access to powers that allow her to cross space and time. Ciri has ashen grey hair and green emerald eyes, a trait that runs in her family. Dandelion (Polish: Jaskier) is a poet, minstrel, bard and Geralt's best friend. The Polish word jaskier actually refers to the Buttercup flower (Ranunculus). Some of his more famous ballads were about the relationship between Geralt and Yennefer. By the time of the saga he is already in his 40s though it is said that he appears to be in his 30s and is sometimes mistaken for an elf. He accompanies Geralt in many of the short stories and ends up joining his hansa while searching for Ciri. Although no map of the universe created by Sapkowski has been released, several maps have been created by fans. According to Sapkowski, the existing maps are "mostly accurate" and he uses a version created by Czech translator Stanislav Komárek. The Continent can be divided into four regions. The Northern Kingdoms (where most of the saga takes place) consists of Aedirn, Cidaris, Cintra, Hengfors League, Kaedwen, Kerack, Kovir and Poviss, Lyria and Rivia, Redania, Temeria and Verden and several minor duchies and principalities such as Bremervoord or Ellander. The Nilfgaard Empire occupies most of the area south of the Northern Kingdoms. The eastern part of the Continent, such as the Korath desert, Zerrikania, Hakland and the Fiery Mountains, is mostly unknown. The book series mentions overseas countries with whom the Northern Kingdoms trade, including Zangvebar, Ofir, Hannu and Barsa. Sapkowski created a language for the series known as Elder Speech, based on Welsh, English, French, Irish, Latin and other languages. Dialects are spoken on the Skellige Islands and in Nilfgaard. In an interview Sapkowski explained that he wanted the language to be reasonably legible to a reader, to avoid footnotes. As he said: "In my book, I do not want for an orc telling to another orc 'Burbatuluk grabataluk!' to be supplied with a footnote: 'Shut the door, don't let the flies in!'" The stories and novels have been translated into Slovak, Czech, Danish, Portuguese, German, Russian, Lithuanian, Estonian, Finnish, French, Spanish, Italian, Bulgarian, Romanian, Ukrainian, Serbian, Swedish, Hungarian, Dutch, Chinese, Georgian, English and Persian. Sapkowski chose wiedźmin as the male equivalent of the Polish word for witch (wiedźma). In his book 2005 book-interview Historia i Fantastyka Sapkowski noted that the word "witcher" is a natural male version of the English word "witch", and implied that the similarity between those two words, as well as between the German terms, was the inspiration coining wiedźmin as a new Polish word. Polish video game designer Adrian Chmielarz claimed to have invented the translation of wiedźmin into English as witcher around 1996-1997. Although wiedźmin is now usually translated into English as "witcher", an earlier translation of the title was "hexer" (the title of the 2001 film adaptation and the first official English translation in the 2000 short story collection Chosen by Fate: Zajdel Award Winner Anthology); Hexe and Hexer are the German words for "witch" and "warlock" respectively. CD Projekt used "witcher" for the title of its 2007 English release of the video game, and Danusia Stok used it in her translation of Ostanie życzenie that was published the same year. Michael Kandel however used "spellmaker" in his 2010 translation of "Wiedźmin" short story for A Book of Polish Monsters anthology. Droga bez powrotu (The Road with No Return) – Based on the short story "Droga, z której się nie wraca"
Zdrada (Betrayal) – Based on an "unused idea for a short story"
On October 11, 2013, Dark Horse Comics announced a comic book series called The Witcher, based on the video-game series and made in collaboration with CD Projekt Red. The Hexer is the title of a 2001 film and a 2002 TV series, both directed by Marek Brodzki. Michał Żebrowski played Geralt in both. In several interviews, Sapkowski criticized the screen adaptations: "I can answer only with a single word, an obscene, albeit a short one." In 2015, Platige Image planned an American film adaptation of the novel series to arrive in 2017. In May 2017 they announced that they would be producing a The Witcher TV series in cooperation with Netflix and Sean Daniel Company, with Tomasz Bagiński as one of the directors and Sapkowski as a creative consultant. Henry Cavill will be portraying Geralt of Rivia in the Netflix adaptation. On October 10, 2018, it was announced that Freya Allan and Anya Chalotra had been cast as main female characters, Ciri and Yennefer. A tabletop role-playing game based on Sapkowski's books, Wiedźmin: Gra Wyobraźni (The Witcher: A Game of Imagination) was published by MAG in 2001. Another tabletop game based on the video games, produced by R. Talsorian Games, was planned for release in 2016 but was delayed and finally released in August 2018. In 1996 and 1997 a Witcher video game was being developed by Metropolis Software in Poland, but it was cancelled. The game's director was Adrian Chmielarz, former People Can Fly co-owner and creative director, who coined the translation "The Witcher" during its development. According to Chmielarz, the game would have been a 3D action-adventure game with role-playing elements such as moral choices and experience points. In 2003, Polish video-game developer CD Projekt Red negotiated with Sapkowski for rights to The Witcher, given the languishing work at Metropolis, and released The Witcher, a role-playing game based on the saga in October 2007 for personal computers. It was well-publicized and, although it was the developer's first game, it received critical praise in Europe and North America. The Witcher was published in Poland by CD Projekt and worldwide by Atari. A console version, The Witcher: Rise of the White Wolf with the same story and a different engine and combat system, was scheduled for release in fall 2009 but was cancelled that spring. The Witcher: Crimson Trail (Polish: Wiedźmin: Krwawy Szlak), also known as The Witcher Mobile is a mobile-phone action game created by Breakpoint on license from CD Projekt in November 2007. It features a young Geralt as a promising student who has completed his training to become a monster-slayer – a witcher. The Witcher: Versus was a Flash-based multiplayer fighting browser game, developed for CD Projekt Red by one2tribe and released in 2008. In the game, which has been discontinued, players created a character from one of three classes and challenged other players in battle. The Witcher 2: Assassins of Kings is the sequel to The Witcher, developed by CD Projekt Red. On September 16, 2009, before Assassins of Kings was introduced, a video of the game was leaked; two days later, CD Projekt Red confirmed that it was in development. Assassins of Kings was published in Poland by CD Projekt, by Namco Bandai Games in Europe and by Atari in North America. The game was also distributed digitally through Steam and DRM-free on Good Old Games. CD Projekt Red announced The Witcher: Battle Arena, a free-to-play multiplayer online battle arena game for mobile devices, on July 1, 2014. The Witcher 3: Wild Hunt was released on May 19, 2015, and has become considered one of the greatest games of all time, shipping over ten million copies by March 2016. By March 2018, the series as a whole has sold over 33 million. Geralt appeared as a guest character in the 2018 fighting game, Soulcalibur VI. In October 2018, Sapkowski sent notice to CD Projekt demanding he be remunerated for sales of The Witcher video games, asking for more than 60 million Polish złoty (more than US$15 million) representing between about 5% and 15% of the game's revenues over the years. Sapkowski had originally provided the license to CD Projekt based on a lump sum payment, but now believes he is due more since the series has become much more successful than expected. CD Projekt stated that while they had met all obligations on the initial acquisition of the license, they will work amicably with Sapkowski's legal representatives to come to a fair outcome for all parties. By February 2019, CD Projekt worked out a settlement agreement that would provide Sapkowski additional royalties for their video game series, though not as great that Sapkowski had asked for, as to maintain a working relationship with the author for future Witcher projects. In 2007, Kuźnia Gier developed two card games based on CD Projekt's The Witcher video game. One, Wiedźmin: Przygodowa Gra Karciana (The Witcher: Adventure Cardgame), was published by Kuźnia Gier; the other, Wiedźmin: Promocyjna Gra Karciana (The Witcher Promo Card Game) was added to the collector's edition of The Witcher in some countries. A card game, known as "Gwent", was included in The Witcher 3: Wild Hunt as an in-game activity. Two stand-alone games based on it, titled Gwent: The Witcher Card Game and Thronebreaker: The Witcher Tales, were released in 2018. CD Projekt Red and Fantasy Flight Games released The Witcher Adventure Game, a board game designed by Ignacy Trzewiczek, in 2014 in physical and digital forms. The digital version is available on Windows, OS X, Android and iOS. ^ Ewa Mazierska (2007). Polish postcommunist cinema: from pavement level. Peter Lang. p. 17. ISBN 978-3-03910-529-8. ^ a b Whitbrook, James (June 21, 2015). "How To Get Into The Witcher Novels". io9. Retrieved November 4, 2018. ^ "The Witcher series has sold over 33 million copies worldwide - VideoGamer.com". ^ "Opowieści ze świata wiedźmina (antologia) - literatura.gildia.pl - książki, recenzje, artykuły, nowości". www.literatura.gildia.pl. ^ "Tylko dla fanów wiedźmina Geralta. Szpony i kły - recenzja Spider's Web". November 16, 2017. ^ "Nikczemnie wprowadzająca w błąd okładka. Wiedźmin: Szpony i Kły nie jest książką Sapkowskiego, ale… fanów". November 2, 2017. ^ Makuch, Eddie (May 12, 2015). "This Witcher 3 Cosplay Is Excellent". ^ Sapkowski, Andrzej (May 2008). The Last Wish: Introducing the Witcher (Original title (Polish): Ostatnie Zyczenie) (1st ed.). New York: Orbit. pp. 92, 149. ISBN 978-0-316-02918-6. ^ Péter Apor (2008). Past for the eyes: East European representations of communism in cinema and museums after 1989. Central European University Press. p. 198. ISBN 978-963-9776-05-0. Retrieved May 28, 2011. ^ ""Nie bądź, kurwa, taki Geralt" - interview on author's page" (in Polish). Archived from the original on December 15, 2007. ^ Marek, Ruszkowski (2004). Wielojęzyczność w perspektywie stylistyki i poetyki. Wydawnictwo Akademii Swiętokrzyskiej. p. 98. ISBN 83-7133-232-7. ^ "Projekt słownika Starszej Mowy". Archived from the original on March 24, 2014. Retrieved March 6, 2013. ^ НО МЫ ЖЕ СЛАВЯНЕ! РАЗГОВОР С АНДЖЕЕМ САПКОВСКИМ, An interview with Sapkowski for Russian monthly magazine "World of Fatnastics"
^ "superNOWA - Andrzej Sapkowski" (in Polish). ^ a b c "Gollancz Acquire Three More Witcher Novels". Gollancz Blog. January 19, 2015. Retrieved January 22, 2015. ^ Hall, Lindsey (February 1, 2016). "Cover Launch: THE TOWER OF SWALLOWS". Orbit Books. Retrieved February 8, 2016. ^ "Orbit and Gollancz to Publish Season of Storms by Award-Winning Polish Author Andrzej Sapkowski". Orbit Books. May 19, 2017. Retrieved May 30, 2017. ^ a b c Andrzej Sapkowski; Stanisław Bereś (2005). Historia i fantastyka (in Polish). SuperNOWA. p. 268. ISBN 978-83-7054-178-1. ^ a b Purchese, Robert (May 19, 2015). "The Witcher game that never was". Eurogamer. Retrieved May 22, 2015. ^ "The Witcher: The Road from Rivia to Hollywood". Culture.pl. Retrieved October 8, 2018. ^ "Title: The Last Wish". www.isfdb.org. Retrieved October 14, 2018. ^ Sapkowski, Andrzej (December 14, 2008). The Last Wish: Introducing the Witcher. Orbit. ISBN 9780316055086. ^ Wodzynski, Lukasz (2011). "A Polish Book of Monsters: Five Dark Tales from Contemporary Poland". Cosmopolitan Review. 3 (2). Retrieved October 14, 2018. ^ "Wiedźmin: droga z Rivii do Hollywood". ^ "NYCC 2013: THE WITCHER COMES TO DARK HORSE". Dark Horse Comics. October 11, 2013. Retrieved March 20, 2014. ^ "The Witcher Volume 1 TPB". Dark Horse Comics. ^ "The Witcher Volume 2: Fox Children TPB". Dark Horse Comics. ^ "The Witcher Volume 3 Curse of Crows TPB". Dark Horse Comics. ^ "The Witcher Library Edition Volume 1 HC". Dark Horse Comics. ^ "Анджей Сапковский: "Мне пришлось искать свое русло. И я его нашел..."". fantlab.ru. ^ Eddie, Makuch. "The Witcher Movie Coming in 2017 From The Mummy Producers". Gamespot. Retrieved November 5, 2015. ^ Image, Platige. "We started production of the series based on "The Witcher" in coop. with @NetflixUS and SeanDanielCompany. Tomek #Bagiński one of the dir!pic.twitter.com/hYXWCHySOF". ^ Association, Press (May 17, 2017). "The Witcher Saga: has Netflix found its Game of Thrones?" – via www.telegraph.co.uk. ^ "Henry Cavill on Instagram". ^ "Henry Cavill to Star in 'Witcher' Series at Netflix". ^ "Henry Cavill to Topline Netflix Drama Series 'The Witcher'". ^ CNN, Sandra Gonzalez,. "Henry Cavill will lead 'The Witcher' series for Netflix". ^ Petski, Denise (October 10, 2018). "'The Witcher': Netflix Fantasy Drama Series Casts Its Females Leads Ciri & Yennefer". Deadline. Retrieved October 11, 2018. ^ "R. Talsorian: Buy yourself a witcher". August 3, 2018. ^ Purchese, Robert (June 16, 2014). "The Witcher game that never was". Eurogamer. Gamer Network. Retrieved June 16, 2014. ^ Purchese, Robert (May 17, 2015). "Seeing Red: The story of CD Projekt". Eurogamer. Retrieved October 21, 2015. ^ "The Witcher: Crimson Trail". GameBanshee. Retrieved July 3, 2012. ^ Yin-Poole, Wesley (July 1, 2014). "The Witcher: Battle Arena is a F2P MOBA for mobile". Eurogamer. Gamer Network. Retrieved July 1, 2014. ^ Makuch, Eddie. "Witcher 3 Ships Almost 10 Million Copies - Report". GameSpot. Retrieved September 22, 2016. ^ Harradence, Mike. "The Witcher series has sold over 33 million copies worldwide". VideoGamer.com. Retrieved June 29, 2018. ^ Wong, Alistair. "Geralt Shows Off His Sword And Signs Gameplay In Soul Calibur". Siliconera. Retrieved June 29, 2018. ^ Martin, Matt (October 2, 2018). "CD Projekt refuses to pay The Witcher author's new demands of $16 million for rights to work". VG247. Retrieved October 2, 2018. ^ Kerr, Chris (February 5, 2019). "CD Projekt agreed to pay The Witcher author additional royalties". Gamasutra. Retrieved February 5, 2019. ^ "Wiedźmin: Przygodowa Gra Karciana". gildia.pl. ^ "Gry na zamówienie. Kuźnia Gier. Produkcja i kreacja gier planszowych na zamówienie klienta!". grynazamowienie.pl. ^ Newhouse, Alex. "PS4/Xbox One/PC Gwent: The Witcher Card Game Open Beta Coming Next Week". GameSpot. Retrieved May 24, 2017. ^ Robert, Purchese (September 18, 2018). "CD Projekt Red dates full Gwent: The Witcher Card Game release, and standalone Thronebreaker adventure". Eurogamer. Retrieved March 19, 2019. ^ "The Witcher Adventure Game - Board Game". BoardGameGeek. ^ Matulef, Jeffrey (January 8, 2014). "The Witcher gets a board game spin-off". Eurogamer. Gamer Network. Retrieved January 9, 2014. ^ Purchese, Robert (November 27, 2014). "The Witcher Adventure Game has been released". Eurogamer. Gamer Network. Retrieved November 27, 2014. Wikimedia Commons has media related to The Witcher.